As if you didn’t feel enough pressure to make this year’s production of Our Town, the best play New Jersey has ever seen. Images of North Bergen High School’s Alien: the Play hit the internet this weekend like a reverse chestburster, and Entertainment Weekly got in touch with the school’s drama teacher to find out more about the truly iconic production, based on Ridley Scott’s 1979 sci-fi classic Alien. The show even has its own trailer, though we’re sad to say you just missed its two-day bi-weekend run. First posted to Reddit by a North Bergen student, the show was directed by drama teacher Perfecto Cuervo, with production help from art teacher Steven Defendini and music teacher Brian Bonacci, not to mention the show’s illustrious cast, listed in the video above. 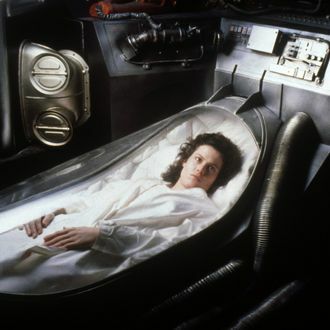 Alien: the Play featured a home-fabricated version of Ridley Scott’s xenomorph, which reportedly prowled the audience during scene changes, as well as a facehugger. As Cuervo told EW, “my inspiration was just that I’m a huge fan of the movie.” Last year’s play? That’s right, a stage interpretation of Night of the Living Dead.